Nights out are the best. Last December, J made a comment in passing that she’d like to see the New Kids on the Block show that was coming to Van Andel Arena. I passed along this information to my parents who were still looking for a Christmas gift for her. They bought the tickets and offered to come up to babysit so J and I could have a night out in Grand Rapids. We decided to make an evening out of it and do dinner before the concert. 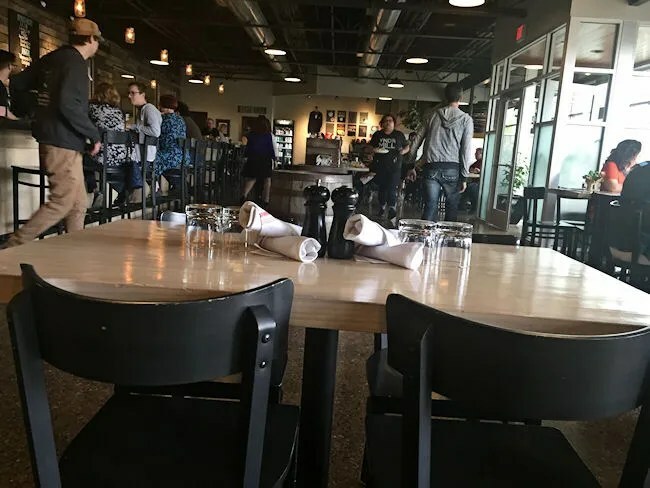 I have so many places in Grand Rapids that I want to eat at, but I picked one I knew J would love. Our first stop of the night was at Vander Mill Cidery and Restaurant. 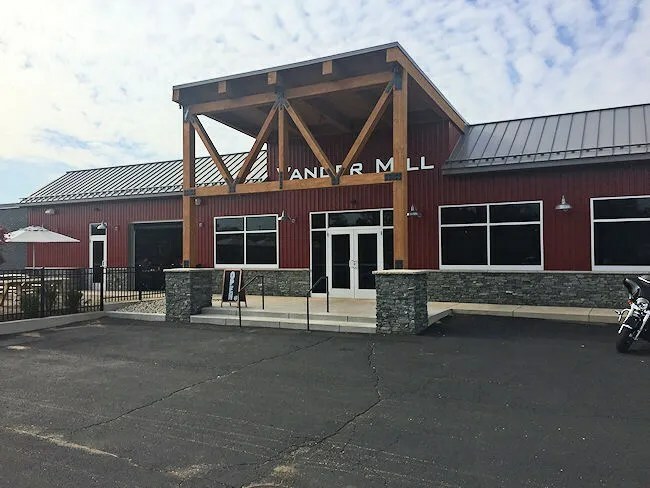 J has recently become a big fan of Vander Mill’s Totally Roasted cider and I’ve wanted to check this place out since it opened in April of 2016. 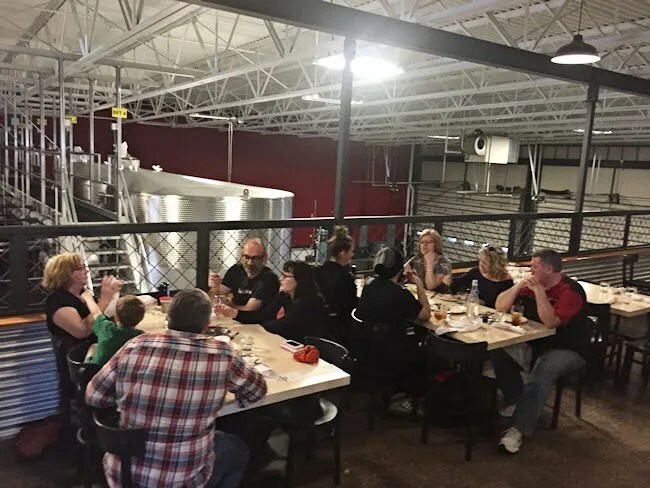 I have a lot of co-workers that have raved about the place for the food, the cider, and the ambiance of the former beer distributing facility located on Ball Avenue just north of Michigan Street. Vander Mill started in 2006 as a traditional cider mill in Spring Lake. Hard cider has exploded in Michigan beginning in about 2009 as Vander Mill quickly adapted. They outgrew their production space in Spring Lake so they moved to this 40,000 square foot building on Grand Rapids North East side. We always get nervous when going out anymore about crowds. We had time to eat, but we didn’t have a lot of time to spare. We pulled into the “upper” parking lot just before 5:30 on a Saturday night and thought it was odd there weren’t many cars there. That’s when we noticed the “lower” parking lot where most people were parked. Still, it didn’t look too crowded and we were hopeful we’d be able to get a table quickly. We were met right inside the door by a hostess who asked if we wanted to sit inside or out. It was a nice night out, but it had gotten windy so we chose to stay indoors. We were taken to a table near the kitchen and handed drink menus to look over while our waiter poured us each a glass of water. The dining room at Vander Mill is quite large. We didn’t really have to worry about getting a table. The place was busy, but there were still a few more open spaces around us. 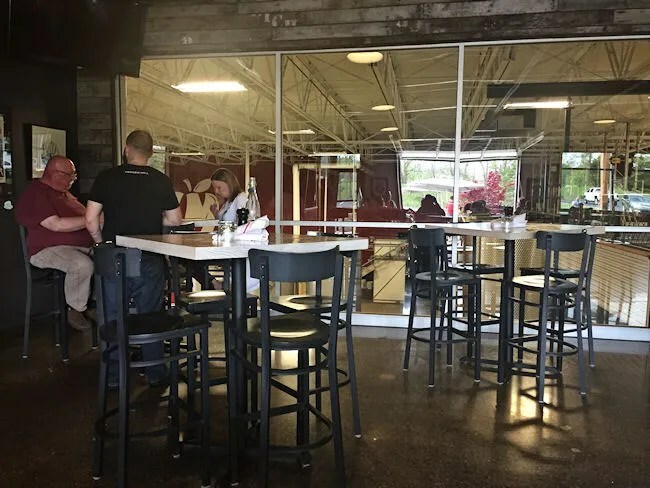 and this really cool space which they call the Mezzanine that is kind of like a porch in the production facility looking down on all that stainless steel used to make the delicious cider we were sipping throughout dinner. J was super excited when the draft list was set down in front of us. We have never been to a place that offers so many different cider choices. She felt like I usually feel when we go to a brewery. A little overwhelmed with all the choices, but so excited to try as many as she possibly could. I like cider and will gladly drink it. I help J all the time finish off bigger bottles and I do enjoy sampling them as much as I enjoy sampling beers. 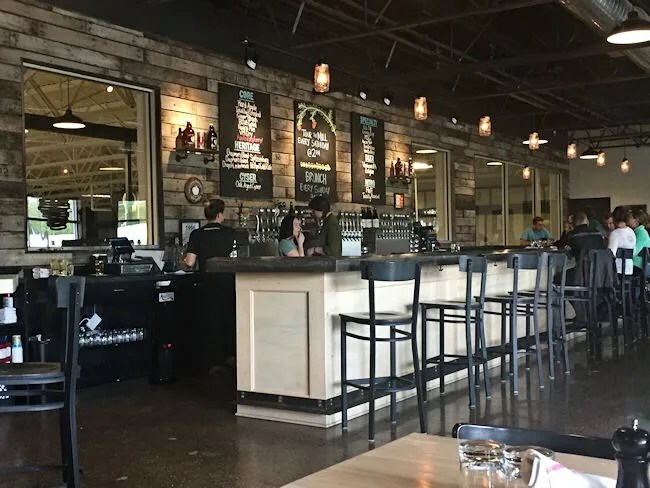 I did find a couple of the ciders that I would have tried, but they had a couple of their own beers on tap, so I went that way instead by ordering the VanderSide IPA. 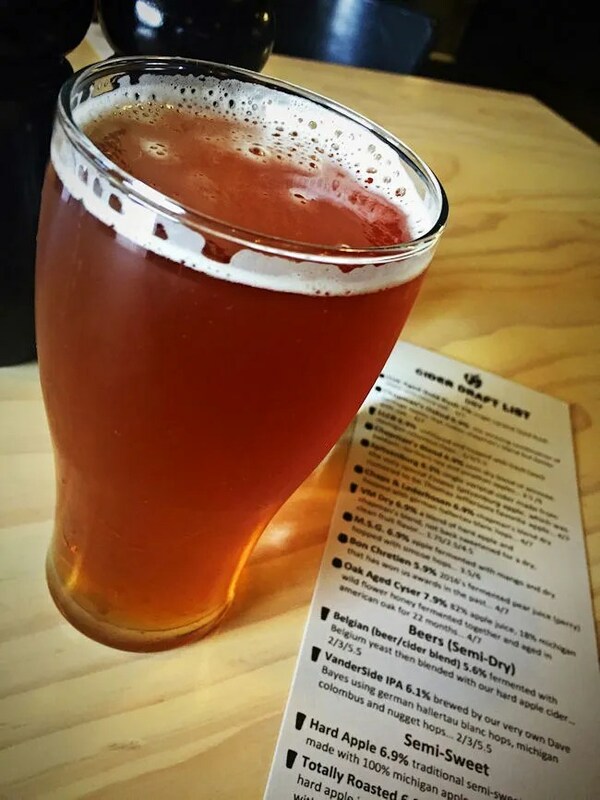 Their take on an IPA is made with a mixture of German and Michigan hops and came with a slightly citrusy flavor. I actually really enjoyed it and considered ordering a second, but we still had plans for the evening and we were a long way from home so one was enough. J went all in with a flight. She picked ciders that we don’t see in cans despite the fact she assumed she would get a Totally Roasted. 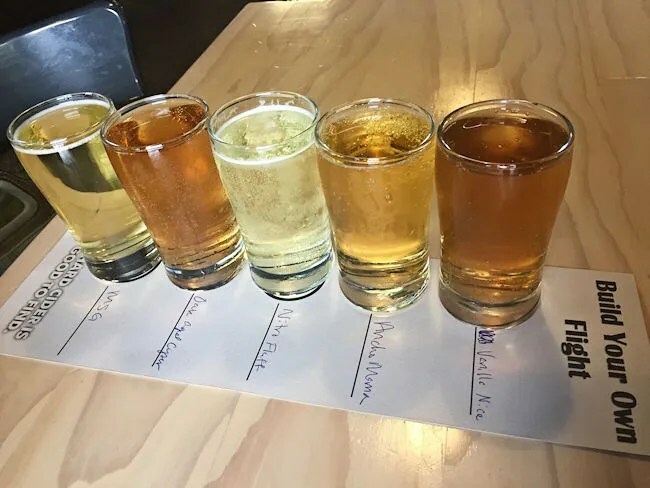 The cider flights consists of five picks. She chose Vanilla Nice, Ancho Mama, Nitro Fluff, Oak Aged Cyser, and M.S.G. The clear winner was Vanilla Nice which was almost a dessert cider. It had a very strong aroma and taste of vanilla. I took a taste of this one as well. It’s a really nice sippin’ cider. Not something you can drink very fast, but very tasty. We passed on appetizers and went straight for dinner. We had eaten lunch at Culver’s with the family just a few hours prior so we weren’t super hungry despite the fact it was dinner time. I ordered the House Burger. The sandwich is a mixture of Prime chuck and brisket. It’s topped with a house made pimento cheese, lettuce, pickle, and a garlic aioli which I asked to leave off. The sandwich is served on a potato bun from Field & Fire. This burger came out pretty perfectly. It was slightly pink in the middle, very juicy, very tender, and that pimento cheese gave it just a hint of spiciness. I devoured this sandwich in what would be record time for most people but is just another Saturday night for me. The sandwich came with a salad, but I upgraded to fries for a little extra. They were crispy, battered fries that were a perfect compliment to a delicious burger. J ordered something listed on the menu as ham + doughnuts. She was hesitant because the ham was prosciutto and I think that she thought this was going to be some kind of sandwich. It’s not a sandwich and when the plate was set down in front of her, she was incredibly happy that she went with her gut and ordered this thing. 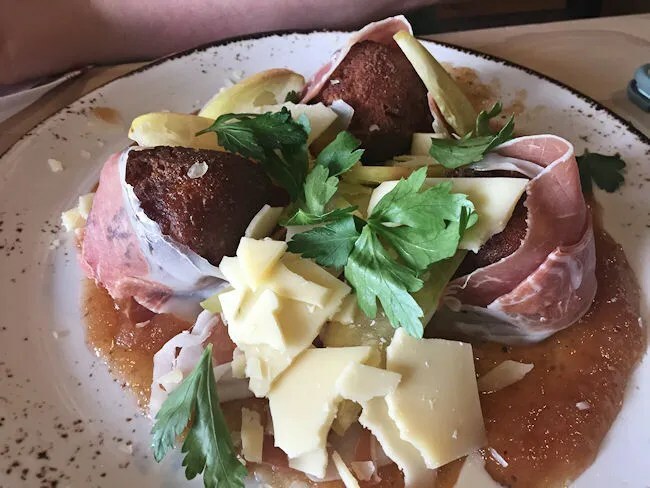 The ham + doughnuts is a dish with three doughnut holes wrapped in prosciutto and served on a layer of apple butter with Red Barn Cupola cheese. The doughnuts come out warm and covered in sugar which is so perfect with the saltiness of the prosciutto and the sweetness of the apples. This dish was absolutely amazing. At first, J was kicking herself for not adding on an order of fries, but in the end, this was more than enough and insanely satisfying. Our waiter was trying pretty hard to push dessert, but we were both stuffed. We did throw him a bone and raise the price of our meal. 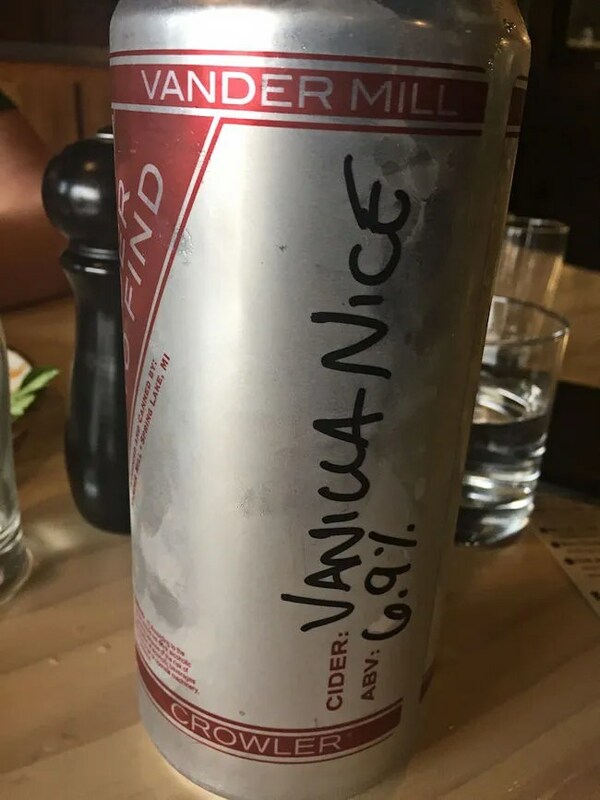 J really liked the Vanilla Nice cider. I asked about Crowler’s as I thought I could see the capping machine behind the bar. He went and grabbed us a Crowler of that yummy cider to round out our night. Our bill for the evening came out to a little over $62 before the tip, but that included $16 for the cider we were taking home. 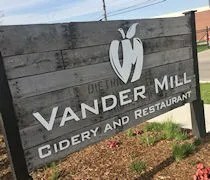 Vander Mill Cidery & Restaurant was a huge surprise to me. 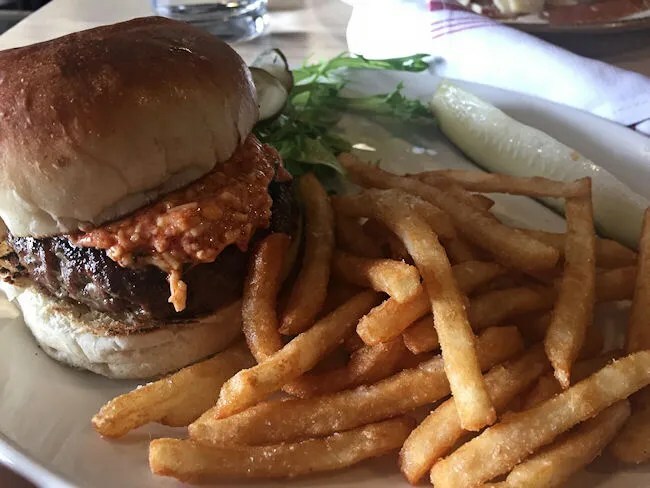 I really didn’t know what to expect, but what we found was a great restaurant with a fabulous menu and an insane draft list. J is already planning her next trip to Grand Rapids. 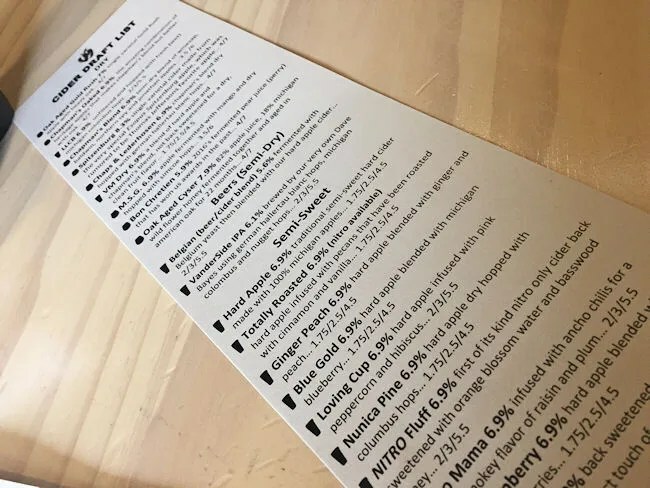 There is so much more on that draft list that she hasn’t tried and so much more on the menu we want to explore.